Signal Conditioner Equipment (SCE) electronics assembly manufactured by North American Rockwell's (NAR) Autonetics Division. The 45 pound hermetically sealed package resided in the Apollo Command Module's lower equipment bay and drew 28 volts dc/35 watts. The SCE transformed signals from sensors and transducers to basic 0 to 5 volt DC instrumentation analog (coded measurements) voltage level. 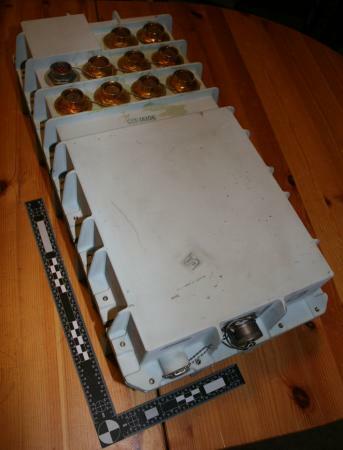 Signals were then distributed to the Pulse Code Modulated (PCM) telemetry and Command Module displays; and provided excitation voltages to some of the instrumentation sensors and transducers. The SCE contains a DC differential amplifier assembly, DC differential bridge amplifier, AC to DC converter, DC active attenuator, and redundant 20, 10 and 5 volt DC power supplies. Also included is an error detection circuit which automatically switched to the redundant power supply if the primary power supply voltages fell out of tolerance. A switch on spacecraft's main console also permitted manual toggling between either power supply (it was this switch that was toggled by astronaut Alan Bean during the launch of Apollo 12 which prevented an abort and restored telemetry after a lightning strike impacted the launch vehicle disabling spacecraft electronics).